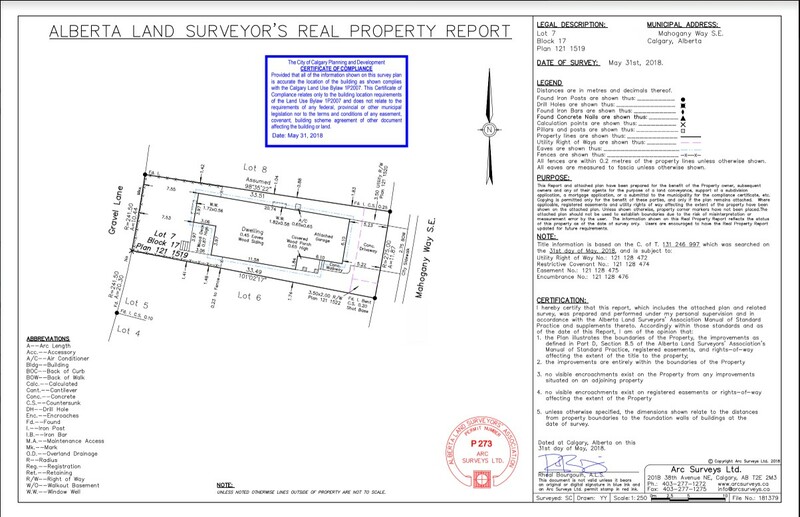 A Real Property Report (RPR) is a legal document that clearly illustrates the position of the building in relation to the property lines and municipal bylaws. It takes on the form of a plan or illustration of the various physical features of the property, including a written statement detailing the surveyor’s opinions or concerns. Identifies accurate locations and dimensions of buildings, improvements, right-of-ways, and encroachments relative to boundaries of their property. Any issues regarding the dimensions of the building, improvements, and right-of-way can be resolved before the sale of the property. Home buyers know the physical dimensions of the property, and have peace of mind knowing that their home is within the legal descriptions and boundaries of municipal bylaws. A Real Property Report (RPR) can help with streamlining the financing of a home. Property transactions are simplified when a Real Property Report is prepared before the sale of a home. Home owners avoid delays in completing property transactions, when a Real Property Report is arranged early in the sales process. Read our blog post for a simple step-by step guide on how to order a Real Property Report with Arc Surveys. Most commercial and residential real estate transactions in Alberta require a Real Property Report survey to be completed before the sale of a property. Purchasing a property may be the largest financial investment you ever make. With a Real Property Report, owners are aware of any boundary problems. For example, they know whether their new home is too close to the property line, or if part of their garage is on their neighbour’s land, or vice versa. Since legal complications or a financial holdback of funds can occur if a sold property fails to meet bylaw requirements, a Real Property Report can therefore protect the buyer. 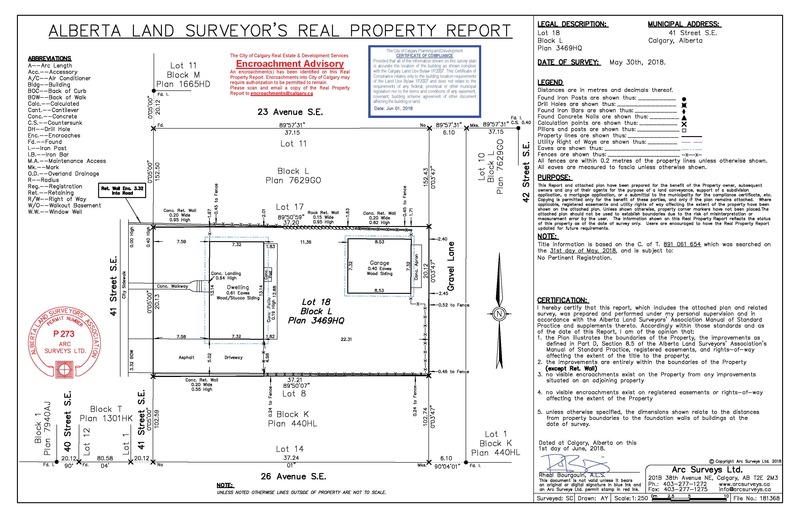 What is shown on a Real Property Report? The Municipality reviews the RPR, and endorses with a compliance stamp or letter if the property meets the required bylaws. Or will issue a rejection letter if the property does not meet local bylaws. Therefore, the property owner can then resolve any outstanding issues identified by the municipality before the sale of the property. To avoid delays in completing the property transaction; have your Real Property Report arranged as early as possible, so that any municipal compliance issues relative to the dimensions of the building, improvements and right-of-ways can be resolved before the sale of the property. How long does an RPR last? In most cases a compliant RPR is valid if no other property improvements have been made to the property other than what is shown on the last compliant RPR, and if municipal bylaws have not changed in regard to the property in question. However, not all municipalities will accept a Real Property Report that is greater than one year old. Contact us to find out if your RPR still valid. Do we need to pay up front for an RPR? No, we take payment at the end, after the process is complete. We will call and or email, to let you know that your RPR is ready for pickup or if there are municipal bylaw concerns with your property. Do we need to be home for RPR? No, all surveying work is completed outside the property. We do not need access to the inside of the house. We ask that all animals are kept inside during the survey and that all fences/gates are left unlocked to give our surveyors access to the entire property. Does the shed need to be shown on the RPR? We typically choose to show all sheds on the property. That way if there is a Bylaw issue with the placement of the Shed, we can let you know. Why are there surveyors on my property if I did not order an RPR? Completing a Real Property Report consists of locating property boundary evidence in the form of buried metal pins. Surveyors will often need access to the boundaries of neighboring properties to find this evidence if the metal pins cannot be located on the property in question. What is an RPR update? In some cases, it is more cost effective to order an RPR update rather than completing a new RPR. A number a critical factor’s come into play when considering an RPR update. For example, the date of the last surveyed RPR, the number of improvements made to the property and municipal Bylaw updates related to your property. Please contact us to see if an RPP update is right for you.